Aging affects multiple organ systems, from the heart and lungs to your bones and metabolism. Of all the changes, musculoskeletal issues have the most impact on the aging senior’s sport. These changes include:an overall decrease in muscle and bone mass; stiffening of muscles; weakening of tendons and cartilage. But the good news is that staying physically active can help manage or prevent many medical conditions, including heart disease, high blood pressure, diabetes, cancer, osteoporosis, obesity and osteoarthritis. The key is avoiding total inactivity for any length of time – which can lead to loss of flexibility, strength and bone mass as well as reduced heart function. Also important is allowing time for rest and recovery and modifying your activity. As you age, it is a matter of understanding your body’s cues and following some preventive measures. *Warm up – Both a good warm-up before, and cool-down after, every activity are critical. *Be consistent – This includes frequency, duration and intensity of your activity. *Alternate days of intensity – It’s good to push yourself sometimes, but not all the time. Alternate days of more intense activity with less strenuous workouts. *Pay attention to the weather – Older athletes need to be mindful of temperature-related illness. Heat illness can occur because of an increased risk of dehydration, decreased sweat gland function, and impaired blood flow in response to elevated core temperatures. Medications, such as beta-blockers and diuretics, also increase risk of heat illness. *Eat right and stay hydrated – Maintain proper nutrition and hydration to promote good health and optimal athletic performance. To avoid chronic problems and longer rehabilitation times when an injury does occur, seek treatment immediately. Initial care consists of protection, rest, ice, compression and elevation. This should be followed up by a guided and progressive rehabilitation program. Physical therapy should focus on restoring function and include range of motion, flexibility and strengthening exercises. 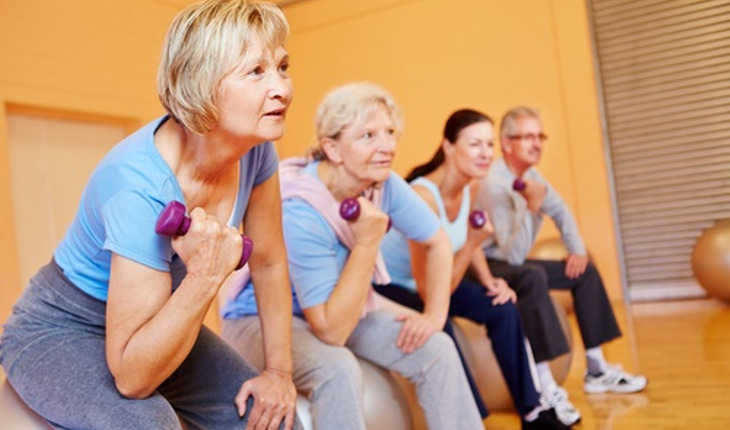 If you’re a senior wants to become more physically active, start by talking to your doctor. Do this before you start any exercise routine so you can move ahead safely into a more active lifestyle. · Strengthening exercises such as weight machines or elastic bands. Be sure to get medical clearance and consider a personal trainer for proper technique. By applying many of the same guidelines used by younger athletes for training, injury management and injury prevention — and being more aware of the physical changes that occur as part of the maturation process — the senior athlete can stay active for a lifetime.